This authentic molcajete salsa is quite simple and easily ground by hand right in an authentic molcajete (mortar & pestle). Hubby and I visited Cabo San Lucas back in 2013. It was such a beautiful trip. We stayed at The Resort at Pedregal, a private little oasis that was still close to the city and all of the activities. It’s built right into a hillside and the service was unmatched. I highly recommend it if you’re planning a visit. 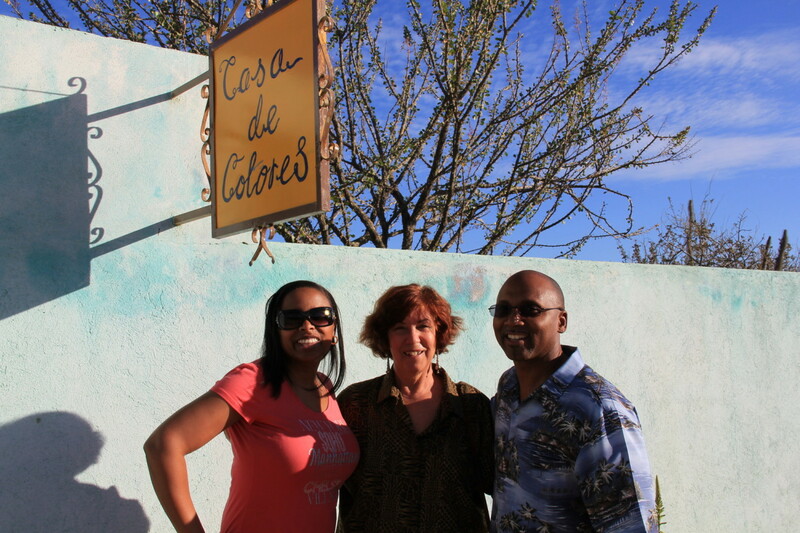 During our visit, we arranged a Mexican Basics cooking class at Casa de Colores with Donna Somerlott. What a sweet lady who grew up in Arizona but now enjoys teaching the art of Mexican cooking right in the heart of Baja Sur. She taught us how to make authentic Chochoyotes, Chiles Rellenos and Salsa Roja De Molcajete. 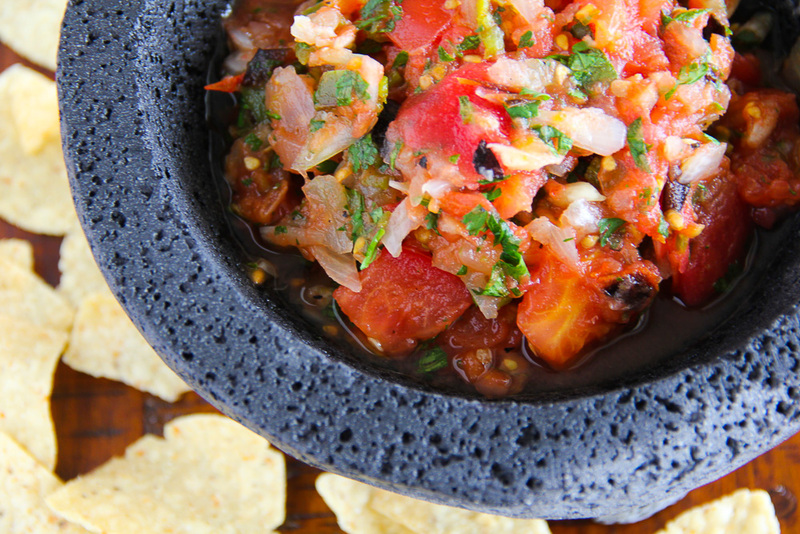 I love a great salsa especially when it’s on the hot and spicy side. It’s super easy to make and you only need a couple cooking instruments, a comal (a flat griddle) and a molcajete (mortar) with a tejolete (pestle). You can find these instruments at your local Mexican grocer on online. Make sure you cure your molcajete before your first use. You need to break it in if you will and excavate all of that grit that is lodged in the pores of the instrument as it’s created directly out of volcanic rock. Yep! Very cool! You could try curing it the old fashioned way by grinding uncooked white rice and water until it no longer turns gray. This way could take a few months before its perfectly cleaned to make salsa! Seriously?!?!? Who’s got time for that? Certainly not me! I took a short cut and carried it down to my local do it yourself car wash. Yep, I used a high pressure hose to push out all of the grit inside for about 10 minutes and…voila! My molcajete was ready to make molcajete salsa. 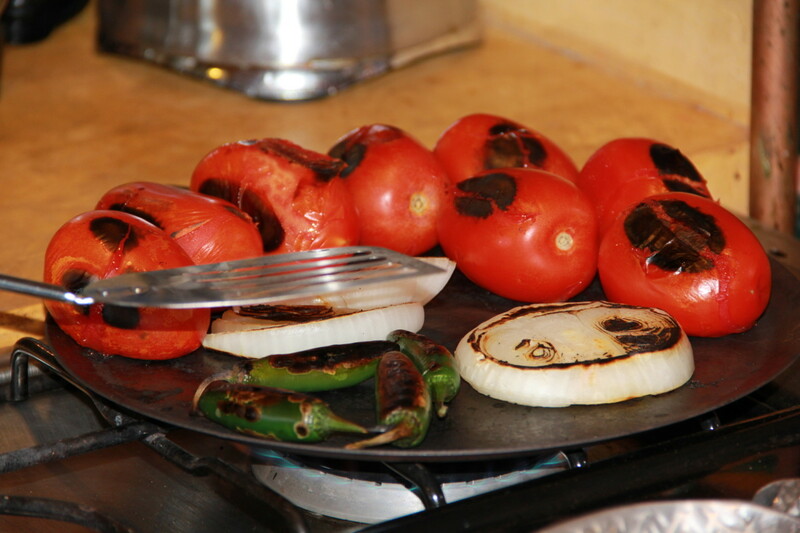 First, you want to roast and blacken 8 tomatoes, 1/2 of a white onion, and 4 serrano chiles. Then add 4 cloves of garlic at the end as you don’t want to blacken them because they’ll become bitter. There is nothing worse. Believe me! Then take your one tomato and a chile (leaving the seeds in if you like a kick or chop off the top where most of the heat lives if you’re shy) and begin to crush them inside your molcajete with the tejolete. Do this in batches until all of the veggies have been grinded to the texture of your choice. I prefer a chunky salsa so therefore, I’m not grinding as long as you would when making a pastier salsa. Your preference! Add some sea salt to taste and 2 T. of chopped cilantro and serve it immediately with a dipper of your choice. This molcajete salsa would be excellent on these totchos and these stuffed sweet potatoes. Say Grace and enjoy! Roast and blacken Roma tomatoes, onion, and serrano chiles. Then add garlic cloves at the end as you don't want them to blacken. Then take one tomato and a chile and begin to crush them inside your molcajete with the tejolete. 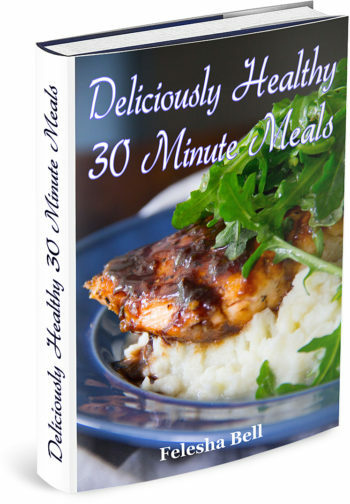 Do this in batches until all of the veggies have been grinded to the texture of your choice. Add sea salt to taste and cilantro. Serve immediately with a dipper of your choice. Say Grace and enjoy! This salsa looks delicious! I love the idea of roasting the veggies first. I usually just cut them up fresh and cold! Thanks Sandy! I know, right! The authentic cooking class with Donna was awesome. Thanks for stopping by! Never considered roasting the veggies first. Great idea! Putting this on my list to have my husband make HAHA! Thanks Mahy! I hope you’ll try it! This looks delicious — I would never have thought to roast the veggies. Hi Lora! This method sweetens the tomatoes and calms the loud garlic and onion. I hope you try it! Ooh, I’ve always wanted to make a homemade salsa! I love how you roasted the veggies (and how you used the car wash to prepare the mortar, hehe;) Will have to try your yummy recipe soon! You should have seen all of the side-eyes at the wash! LOL! I had a plan! Thanks for stopping by, Joscelyn!